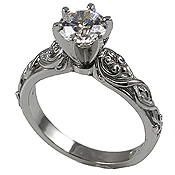 Stock #PL16961A:Exquisite Engagement Ring! with one of our Russian CZs. Can also be left blank to set with your 1 carat stone. This is for the engagement ring only. You can order the complete set from our wedding sets page.